As many people look to better themselves, they tend to step towards a healthier lifestyle. Many people will begin to diet or start to exercise more regularly. Some will have great success while others tend to not see the results that they wanted, but why is this? Many will not see their desired results from simply incorrect form. Today you will learn the correct form for the most common incorrect form for many exercises that you may have done before. Over the course of this article, you will learn that good posture and keeping your back straight are key characteristics to proper form during your workout. Squats can be one of the best exercises for your body when done correctly, but when done wrong, this exercise can seriously injure your body. When squats a performed incorrectly, the most common problems will be only going half way down, knees caving inward, standing on your toes, and finally terrible back posture. When you bend from your back, you are then susceptible to injury. which is why bad form can rob your body of results that it may desperately need. To prevent Bad form during a squat you should allow your legs to slightly wider than shoulder length apart with your toes pointing out at a 45 degree angle. You should also have a straight back with knees bent, but never beyond your toes. Deadlifts are also one of the most common incorrectly performed exercises. One of the main problems when performing exercises is the rounding of your back. When one rounds their back while performing this exercise, they can increase the chance of a back injury. When performing deadlifts, much like squats, you should have your feet shoulder-width apart with your back straight. Many people will also focus on lifting the weight instead of focusing on standing up with the weight in your hands. By focusing on standing up with your head powering straight up, your body will follow your head improving your form and subsequently improving your results. While lunges can be a great leg workout, it can also be a cause arthritis and knee pain. The main problem while lunging is taking baby steps. This can put stress on your tendons causing injuries, and according to https://www.prevention.com can overtime cause arthritis. Also many people will allow their knees to slam on the ground while lunging, this also should not be done due to the terrible injuries that can be caused. To correct you form while lunging you should keep your chest and head upright to not cause any unneeded stress on your back. 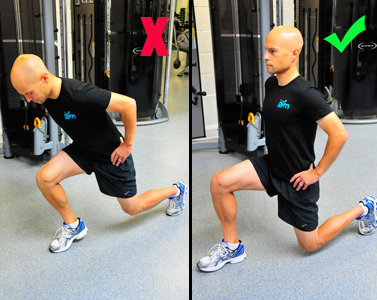 You should also take a big enough step to where your knee does not go beyond your toes while lunging. After fixing these problems during lunging, you will see amazing results and feel a better burn in your thighs. Bicep curls, whether it be with dumbbells or a barbell, is performed incorrectly all of the time. Many people will over-arch their back while swaying their body to pull the weight up. This will not allow your biceps to effectively extend and contract for maximum results. To reach maximum results for big biceps, you should face straight forward with your back straight, then pull the weight up with your elbows remaining stationary with the rest of your body remaining still. This will allow your biceps top effectively extend and contract to fulfill maximum results. For our final incorrectly performed exercise I chose pushups. Although you have most likely been doing pushups since elementary school, you are most likely performing them wrong. Many people will either over arch their back or under arch their back with their elbows flaring out. This can put unneeded stress on your shoulders and will take away results from your workout. The correct form for pushups is to keep your back straight with elbows parallel to your body and finally your head should also be facing straight forward. By doing this, you will maximize your workout and strengthen your core.